Plastics are incredibly useful materials with extremely diverse properties, allowing a multitude of different applications that benefit our lives. Bottles and forks aside, in the medical field alone plastics have been used for artificial heart valves, medical implants and devices, controlled drug release, specialist surfaces and coatings that repel water, organic batteries – the list is endless. But, with marine plastic debris estimated to reach 250m tonnes by 2025, governments across the globe are starting to think about how to overcome this significant problem. A fundamental part of this issue is that non-sustainable, single-use plastics account for up to 40% of global plastic production. This equates to around 128m tonnes. The vast majority of these plastics have low recycling rates and do not biodegrade in an acceptable time span – polypropylene can take millennia to break down properly. Worse still, if these plastics find their way into the marine environment, the motion of the sea along with sunlight can cause the plastics to fracture into small particulates called “microplastics”. The presence of macro and microplastics in our oceans has been shown to have a detrimental effect on marine life. But the potential effect on human health is much less well understood. A ban on the production of cosmetics and personal care products containing plastic microbeads came into effect at the beginning of the year. Though realistically, this only accounts for an estimated 680 tonnes of microplastics per year in the UK. 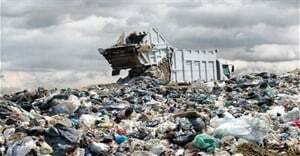 It is clear then that plastic waste is a complicated problem – spanning economics, sustainability, social pressures and recycling infrastructure in both developed and developing countries. But while it’s widely known that plastics can be an issue for the environment, what isn’t often known is that the persistence of plastics in the environment is actually closely linked to how they are made. The overwhelming majority of plastics are made using oil-based materials, meaning that, by their chemical nature, many plastics have no oxygen content. This makes them very hydrophobic (water hating) and, as such, it is very difficult for common bacteria or enzymes to break them down if they enter the environment. Over the past few decades, there has been increased awareness of our dependence on a limited oil supply and this has driven research into alternative, sustainable sources of chemicals. In particular, the concept of using bio-based materials as a resource rather than oil-based materials has really gained momentum. Sustainable bio-based material can be waste crops, waste wood, waste food – in fact, any waste biological matter. Most importantly, these natural, bio-based materials can easily be broken down into smaller chemical building blocks – called “platform molecules” – which in turn, can be used to make other useful chemicals, including plastics. Using these platform molecules, the Green Chemistry Centre of Excellence at the University of York, has been working with the plastics industry to create a new generation of bio-based polyesters. These are often used to make fibres for clothing, as well as films and containers for liquids and foods. The resulting materials are entirely plant based, recyclable and – importantly – fully biodegradable. Aside from sustainability, the huge benefit of using biomass as a resource is the high quantity of oxygen that is incorporated into nature’s chemical structures (celluose, glucose etc). By using bio-based materials to make bio-based plastics, the oxygen content is kept in the material. The hope is that by having a high oxygen content, the bio-based plastics will have high, but controlled biodegradability. This means that the bio-based plastic can totally and safely break down into benign starting materials. But although this new generation of sustainable plastics is a huge step forward, and a compostable plastic is of huge benefit, this is by no means the end goal for all bio-based plastics. The circular economy is all about keeping resources in a constant loop, reusing and recycling them as many times as possible. This helps to minimise waste and reduce the need for brand new resources. Treating plastic waste as a resource rather than a problem is an important change than needs to happen over the coming decades. This will help to preserve our remaining chemical materials, as well as protect our environment. Plastics are a fundamental part of modern society and they are here to stay. Ultimately, society has to move away from oil-based products towards sustainable bio-based alternatives. But regardless of whether a plastic is oil-based or plant-based, the biggest impact you can have on the life cycle of a plastic product is to reuse and recycle it. As a consumer, this means you have a choice and the power to make a positive impact. Find out where your nearest plastic waste recycling point is and look to promote home collection and the proper recycling of all types of plastic waste. So next time you use the last of the ketchup, help to preserve our resources by making sure your plastic waste stays in the recycling loop. James William Comerford, postdoctoral research associate, University of York.